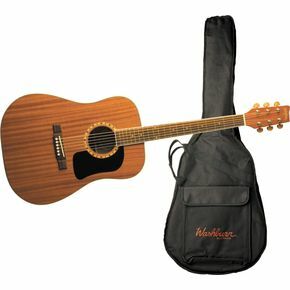 The Washburn D100DL Acoustic Guitar is designed for beginning students or as an affordable choice for a second or travel guitar for the more experienced player. When it comes to choosing the best acoustic guitars for beginners there are three things that are very important; sound, playability and price. The D100DL has them all. Built on a dreadnought body, the D100DL is made completely of laminate mahogany which gives it a clear, mellow tone that works well for keeping beginners interested in continuing to play and practice and has enough attention to details (what with the multi-laminated top binding and pearloid fingerboard inlays) to keep everyone happy. Choosing a guitar with a laminate mahogany body can be a plus for those traveling with the guitar or if choosing this guitar for a child, as the laminate makes for a more sturdy instrument. Made with a flatter neck for easier playability, the D100DL can be difficult for younger or more slightly built players to manage given its dreadnought platform. But if you can manage the reach its action is actually quite good and it holds its tune very well for a guitar in this price range. And speaking of which; at just ~$149, the D100DL will definitely not break your bank. It even comes with its own gig bag. See more great guitar reviews at Washburn Acoustic Guitars. Requesting that somebody compose a paper is considered humiliation assignment yet in this decade individuals search for the most expert and handy journalists to put all the weight of composing on his shoulders. Our essayservicey.com writers webpage are prepared to acknowledge your testing points for composing an articles or different papers. It may sound silly, but re-stringing this guitar with custom light Nanoweb Elixirs will improve the sound immensely. They're expensive wires, but, hey! What's another $15 or so?? The dealer might even do it for free...it's been known to happen.